The Aura is an accessory. A ticket for an accessory that can be attached to select armors. Accessory tickets can be redeemed at the Accessorizor in the Haven Bazaar. Prismatic Aspect(s): Depends on aura. Use the Control+F keyboard function and search for "prismatic" to find prismatic auras. More than one version of this item has been released. Many have their own related news art. The images in the Overworld column are animations. Click to navigate to a page that will play an animation. Some images are animations, especially examples in the overworld column. Click images to see more information, and an animation, if editors have uploaded any. Nemesis Prize Box Constantly sheds fiery particles. An orange glow pulses outward from the chest area. Rare drop from Mewkat Constantly sheds subtle wisps of grey smoke-like effects upwards from the body. Has a bit of a puffy grey glow. Copper Lockbox Prismatic fireflies fly around the player. Overworld: only one firefly gets left behind if the player moves - this is a bug. Twilight is designed to be trailing, but currently only one firefly is not locked to the player's movement. Nemesis Prize Box Silvery-white, star-like shapes flash softly around the player on occasion. Iron Lockbox Black, gnat-like insects fly around the player. Overworld: only one bug gets left behind if the player moves. According to Nick, this aura is a reference to the game "Deadly Premonition." Pinkish-red hearts and particles shower the player. The chest area glows a soft pink. Overworld: leaves hearts in the air for a while. Confection Prize Box Candy-like particles (random in color) stick to the chest and shoulders of the player. Overworld: clusters of sprinkles get left behind for a short while. The NPC Biscotti wears a sprinkle aura. Winterfest Prize Box Large, thick snowflakes constantly generate and fade away around the chest area. Overworld: puts a faint white ring of light under the feet. Solstice Prize Box Yellowish rays of light radiate outwards from the player's chest area. Overworld: puts a golden ring of light under the player's feet. Hunter Prize Box Leaves cover parts of the body and head, attached via a net. Overworld: sheds individual leaves behind the player if the player moves. Surge Prize Box Constantly animates Prismatic glitchy effects around the user. Overworld: occasionally some of the "glitches" will remain for a short while (rarely). The Hacked Aura is similar to the effects seen right before the final fight in the Ghosts in the Machine prestige mission. Rare drop from Mewkat Small wisps with unhappy faces (ghosts, souls, or spirits etc.) fly around the knight. (During the Fall season) Leaves cover parts of the body and head, attached via a net. Overworld: sheds individual leaves behind the player if the player moves. Polar Prize Box Leaves cover parts of the body and head, attached via a net. Supply Depot Sale Leaves cover parts of the body and head, attached via a net. Colossal Prize Box Constantly sheds a purple hazy mist around the user's chest area. Overworld: puts a purple circle under the player's feet. Ancient Prize Box Constantly animates pinkish electric-like effects around the chest. Overworld: occasionally leaves pink sparks behind. Equinox Prize Box A greenish-yellow, round, compass-like effect composed of faded rings slowly rotates in a plane around the body. A sun and moon orbit the body. Blooming Prize Box A green light orbits the player's chest in a slow, sinusoidal manner. Overworld: Leaves a trail of miscellaneous nature behind for a while. It is similar to the visual effects seen around several entities in the Firestorm Citadel. Katastrophe Returns Prize Box Blackish-purple, electric-like effects constantly animate around the chest area. Overworld: This aura leaves blackish-pink crack-like effects behind for a while. The Battle Sprite Seraphynx (Black Kat) obtains a Dreadful Aura if the Disintegration Ray ultimate is chosen (on the Sprite, the aura has no trailing effects). Plunge Prize Box Drips generate around the player's head and legs. Overworld: Leaves a trail of puddles behind for a while. Audio: "Splish" sounds can be heard if the player moves. The Soaked Aura is the first aura to have its own audio noises. 10,000 Apocrean Sigils Appendages constantly wiggle around on the knight's chest. Puts a dark haze around the entire body. Overworld: leaves behind dark pools of unknown substances. The Grasping Aura was the first aura to be "earned" via gameplay. Slime Prize Box Prismatic electric-like symbols cascade down the body at regular intervals. A prismatic ripple-like pattern occasionally emanates from the chest. Vile Prize Box Green mist sheds around the player, sometimes very thickly. Doesn't leave a trail. Rose Regalia Reunion Prize Box Prismatic roses grow and fade as a glowing green light circles the body. Overworld: Thorny rose bushes grow and fade out of puddles of light if the player moves. 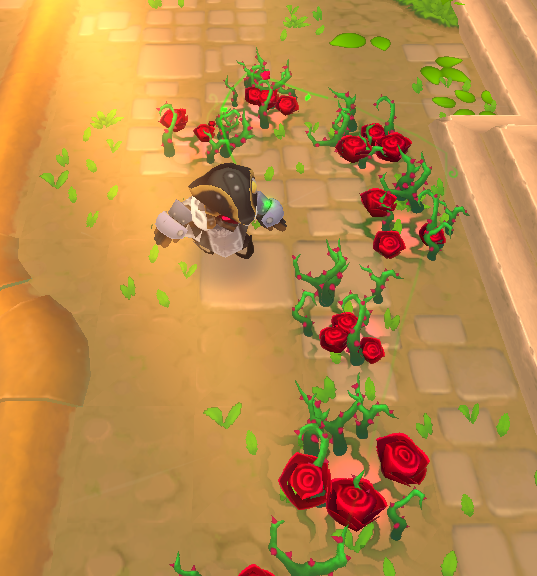 Picture from Steam Newsfeed showing red roses. Dazed Prize Box Stun-like stars shoot around the head. Ruby Prize Box An intensely twinkly aura with pinkish mist that churns and rises up around the torso and arms. A large faceted ruby shaped with a hexagon cut is centered over the chest area. Overworld: Leaves a trail of shattering gems behind for a few moments if the player moves. Audio: Shattering sounds can be heard from the shards as they disappear. Peridot Prize Box An intensely twinkly aura with green mist that churns and rises up around the torso and arms. A large faceted peridot shaped with a trilliant cut is centered over the chest area. Sapphire Prize Box An intensely twinkly aura with blue mist that churns and rises up around the torso and arms. A large faceted sapphire shaped with a pear cut is centered over the chest area. Autumn Prize Box An orange light orbits the player's chest in a slow, sinusoidal manner. Overworld: Leaves a trail of miscellaneous autumn-themed nature behind for a while. It is a Fall Season version of the Blossom Aura. Opal Prize Box An intensely twinkly aura with pale yellow mist that churns and rises up around the torso and arms. A large faceted opal shaped with an oval cut is centered over the chest area. Overworld: Leaves a trail of shattering gems behind for a few moments if the player moves. Citrine Prize Box An intensely twinkly aura with orange mist that churns and rises up around the torso and arms. A large faceted citrine shaped with a radiant cut is centered over the chest area. Stranger Prize Box A prismatic flying snipe whirls around the player. White feather-like light clusters around the chest area. Turquoise Prize Box An intensely twinkly aura with green mist that churns and rises up around the torso and arms. A large turquoise shaped with a trilliant cut is centered over the chest area. Overworld: Leaves a trail of shattering stones behind for a few moments if the player moves. Garnet Prize Box An intensely twinkly aura with pink mist that churns and rises up around the torso and arms. A large garnet shaped with a cushion cut is centered over the chest area. Amethyst Prize Box An intensely twinkly aura with purple mist that churns and rises up around the torso and arms. A large amethyst shaped with a round cut is centered over the chest area. Aquamarine Prize Box An intensely twinkly aura with teal mist that churns and rises up around the torso and arms. A large aquamarine shaped with a marquis cut is centered over the chest area. Wicked Prize Box Leaves cover parts of the body and head, attached via a net. Hunter Prize Box 2016 Leaves cover parts of the body and head, attached via a net. 20px Volcanic Prize Box Torso and arms appear to be constantly on fire. Overworld: Leaves fiery footsteps if the player moves. Glacial Prize Box 2016 Snow is slowly falling around the player. Overworld: Leaves clumps of snow on the ground. 20px Rooster Prize Box Black feathers cover parts of the body and head. Overworld: Sheds individual feathers behind the player if the player moves. 20px Rooster Prize Box Brown feathers cover parts of the body and head. 20px Rooster Prize Box Gold feathers cover parts of the body and head. 20px Rooster Prize Box Burning feathers cover parts of the body and head. Body glows with orange light and fiery particles are constantly shed around it. 20px Rooster Prize Box Prismatic feathers cover parts of the body and head. Lucky Prize Box Clovers and blades of grass cover parts of the body and head. Overworld: Sheds individual clovers behind the player if the player moves. Lucky Prize Box A rainbow shines above the player. Player's body glows with bright rainbow light. Lucky Prize Box Clovers and blades of grass cover parts of the body and head. Player's body glows with soft rainbow light. Slime Lockbox A ??? ooze covers parts of the body and head. A gelatinous cube is formed around the player's chest. Slime Lockbox A light grey ooze covers parts of the body and head. A gelatinous cube is formed around the player's chest. Slime Lockbox A violet ooze covers parts of the body and head. A gelatinous cube is formed around the player's chest. Slime Lockbox A grey ooze covers parts of the body and head. A gelatinous cube is formed around the player's chest. Slime Lockbox A beige ooze covers parts of the body and head. A gelatinous cube is formed around the player's chest. Slime Lockbox An orange ooze covers parts of the body and head. A gelatinous cube is formed around the player's chest. Slime Lockbox A pink ooze covers parts of the body and head. A gelatinous cube is formed around the player's chest. Slime Lockbox A dark red ooze covers parts of the body and head. A gelatinous cube is formed around the player's chest. Diamond Prize Box An intensely twinkly aura with white mist that churns and rises up around the torso and arms. A large faceted diamond shaped with a round brilliant cut is centered over the chest area. Emerald Prize Box An intensely twinkly aura with green mist that churns and rises up around the torso and arms. A large faceted emerald shaped with a princess cut is centered over the chest area. Running Wild Box Constantly sheds clumps of fur. Overworld: Leaves imprints of animal paws in the ground. Aerodynamic Box Rays of light shine from wrists. This is not visible in the tooltip. FlowerTech Prize Box A pink light orbits the player's chest in a slow, sinusoidal manner. Overworld: Leaves a trail of miscellaneous nature behind for a while. It is a pink version of the Blossom Aura. Bejeweled Stranger Prize Box A black flying snipe whirls around the player. White feather-like light clusters around the chest area. It is a black version of the Snipe aura. Bejeweled Stranger Prize Box A white flying snipe whirls around the player. White feather-like light clusters around the chest area. It is a white version of the Snipe aura. Late Harvest Prize Box Neck and wrists are covered with faded yellow straw, head is slightly covered too. Individual straws float around the player. Reacts to knight's actions. Additional rings with runes appear and whirl around arms when defending. This page was last modified on 6 March 2019, at 13:32. This page has been accessed 212,974 times.